I'm always complaining that Long Island, New York isn't dog friendly. We joke that their "No Dogs Allowed" signs must be the official sign of Long Island. We joke that the guy who makes these signs must be a mega-millionaire! For the most part we still feel that way, but recently things have started to change.... slightly. In August our township ruled that the majority of parks in our town would now allow dogs - Woo Hoo!! Throw the confetti & start the parade! Lest we get too giddy with glee however, it was noted that the beautiful little park one block away from my house is NOT on the list. State parks are also excluded from this decree. But hey, we're not greedy! We'll bask in the glory of more access to most of our town's parks for now. Icy and Phoebe can hardly contain their excitement over the new town rule, finally allowing (leashed) dogs in most of the parks! In celebration of this small victory, we decided to check out a new park not far from where we live. Dix Hills Park is a lovely town park with a Golf Course, Pool, and shaded walking path. Look at this patch of moss I discovered!! I'm going to ROLL in it before Mom tries to stop me - Ha, Ha! Icy and Phoebe were so excited to explore a new park. All those glorious new smells!! Phoebe had a ball sniffing and exploring everything along the trail! We had so much fun! We are definitely keeping Dix Hills Park on our list of favorite walking trails! 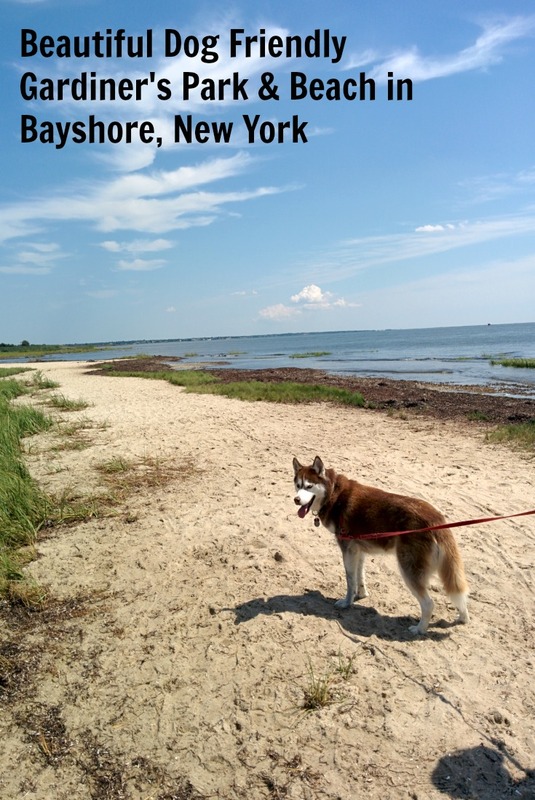 There is an organization on Long Island that works to get more access to public recreational places for dogs. They did a great job convincing our town to finally make many of it's parks dog friendly. I think their success in getting a large chunk of parks to allow dogs came because they focused on people as well as dogs. When trying to get local officials to allow dogs in public recreational areas, most of the time the focus is on the dogs. They focus on how important it is for DOGS to get out and walk, exercise, and enjoy public places. While that is certainly important, I think when you also focus on how important it is for PEOPLE to be able to enjoy these places along with their dogs, public officials take more notice. Pointing out that dogs motivate people to get out and use public spaces more, and that doing so can positively impact a person's health, makes legislators see it as a benefit to the community. The HABRI (Human Animal Bond Research Institute) has been touting this fact for years. HABRI calls it The Pet Effect. They have conducted lots of research that shows how pets have a positive impact on human health in so many ways, both physically and mentally. I'm a huge believer in pets having a positive impact on human health. If it weren't for our dogs, we wouldn't walk and hike nearly as much as we do. We get off our butts and do it for them more than for us! The more people have an opportunity to get out and walk, hike, bike, or run with their dogs the more it can have a positive impact on their physical health. Dogs motivate people to get out and MOVE! Research also shows that pets are one of the reasons many people quit smoking. They don't want to negatively impact the health of the pets with second hand smoke. If you're working to get your local officials to provide more access for dogs in public recreational areas, include the benefits to people not just pets in making your case. Reference the research and Info-Graphics you'll find on HABRI's web site. You can probably even contact them and ask for advice on materials you can share to help make your case. You may have better results getting more access to public places by including the benefits to people as well as pets. Sharing is caring, if you enjoyed this post please Tweet, Pin, or share on Facebook! 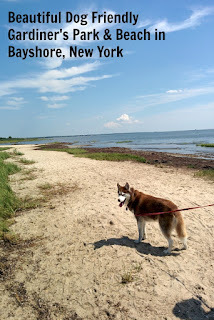 If you enjoyed this post, you may also enjoy My Dogs Excellent Beach Adventure in Gardiner's Park & Beach. Does your community allow dogs in most public parks and other public recreational places? Leave us a comment and share! We love hearing your thoughts. We finally got a dog park and the first weekend someone's dog was killed by a bigger dog! Then, a woman dropped her kids off there to swim in the dog pond! Seriously, I cannot wait to move from this place! LOL! GASP!! OMG, a dog was killed?? That is so awful. Didn't they have a big dog and a small dog section? Some people are just idiots, they think a dog park is a place for kids to play - it's not! We are so lucky in the UK that all of our parks are dog friendly, some do have areas that are enclosed for dogs to run free, others dogs are allowed in the whole park, off and on lead. Good to hear that officials are starting to realise that getting out in the fresh air, walking and enjoying nature is good for us humans as well as dogs! How wonderful!! The Brits are so smart, they know how to do it right, I wish the US would catch on already. Some states are great but so many have a long way to go. I feel blessed to live in a city (San Francisco) which has so many dog parks. Loved how the HABRI institute turned the focus on people needing exercise to underscore how dogs are important for us to go out and about. You're so lucky, California in general is great about being so dog friendly. Arizona is too. It feels like the further East you go the less dog friendly it is! I love seeing all your beautiful pet friendly travel posts - enjoy that! Oh Phoebe, I bet that grass was lots of fun to roll in. We have a bit in our backyard if you want to come over and roll in it. Most of our parks are dog friendly around us including the state parks. Most of the beaches are not, but as I have mentioned Ruby isn't a big fan of water. I definitely agree about dogs making us more healthy emotionally and physically. Dogs always make hiking more fun, too. Yes, Phoebe wants to come over & roll in your moss too!! It's great that most of your parks are dog friendly, it is the opposite here on Long Island. No Dogs Allowed signs are at nearly all the parks which is why I'm so excited about our town's new dog friendly regulation. Dogs make you get out in the fresh air and exercise more! That's great news! All of the city parks allow dogs although there's a couple wildlife areas that don't. There's a bit of dispute about the latter. I'm really happy about it and I hope more parks on Long Island will start to allow dogs. California is so great about being dog friendly. I can understand wildlife refuge places not wanting dogs to frighten or heaven forbid hurt the wildlife but other parks should allow leashed dogs for sure. Thanks so much for including a reference to HABRI (Human Animal Bond Research Institute) in your post. They've been doing serious research into the importance of the human/pet bond for years. It's a great resource when you're trying to get more pet friendly resources established in your town. HABRI is so awesome! I first learned about them at a BlogPaws conference where they did some presentations for us. I'm so impressed by that organization! I had suggested using HABRI info to one of the leaders of the group that fights for more dog access to parks & other recreational places. I'm not sure if he took my advice or came up with it on his own, but I think siting benefits to people was the thing that got our town to provide this additional access! It was a great hike! It must be lovely to run free in the woods near a river! You're so lucky Mishu. Dogs are such good exercise companions. Glad you have more options of where to walk with your dogs now. My current city has several "no dog" zones also, but we do have wonderful hiking trails that allow the pups! Dogs really are great exercise companions and great motivators to get out & exercise more. I'm so happy we have more options now, I hope to see a lot more in our area! That's a beautiful park and I'm so glad Long Island is opening more parks to pets. I'm a firm believer that pets have a positive impact on people's health - I'm working on a post about that right now. I'm so happy about it & I'm glad our town (Huntington) is leading the way! Pets have such a positive impact on people. I look forward to reading your post on that. I'm so glad they finally have realized the benefits of dogs having access to walk or hike with their people! It's exciting for us. That looks like a great place to hike with your dogs! I know a lot of people are motivated by their pets to go out and there and enjoy nature. It is a lovely park w/ great trails. Dogs definitely motivate their people to get out and enjoy nature and exercise! OMG, you should only know all the No Dogs Allowed signs everywhere at parks, beaches, you name it! Nassau County is much worse than Suffolk county on Long Island. We never expect a park to be dog friendly, we're always so delighted when we find parks that allow dogs - but beaches, forget it! There are only a handful that allow dogs. It looks like you had a wonderful walk with Icy and Phoebe. Enjoying nature, getting outside, going for hikes are some of our favorite together time activities with Happy-Go-Doodle Chloe. I'm happy to hear that you and your pups can now have fun at Dix Hills Park...together. It truly was a wonderful walk, I'm so glad we found this park! It's such a joy to walk and hike with our dogs. This is so wonderful to hear, Cathy! My niece's family is from Dix Hills! I'll pass this along to her as she has two Poms who she may like to take for a visit! Oh how funny! I bet they know this park, there's a golf course and pool there too. They may have heard that the township of Huntington (which includes Dix Hills) voted in August to make most of our town parks dog friendly! It's a huge step forward for us. Long Island is NOT a very dog friendly place!